Another tip for the blogger users. Ever thought of having those ‘wordpress’ type of comment box in your blogger ? 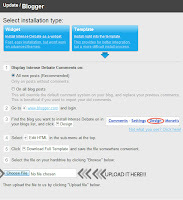 Tired of having the simple blogger comment box ? Want to make your site look elegant ? Easy for readers to read and then comment ? If all the answers are yes, then its time to add ‘intensedebate’ to your blog! Most importantly, it allows you to activate ‘comluv’ which lets you increase traffic to your blog. Follow these simple steps to install IntenseDebate. Choose widget installation or install it right to the template. If you do not want any trouble, widget is for you but installing right to the template is preferred. The first option you will get is whether you want it in all posts or on all blog posts. It is recommended you click the first option, because when I tried the second option I lost all my previous comments! But if you have just started blogging, I guess the second option is just fine for you. After intensedebate uploads your file it will take you to the third and the final step.